Time your launches right, and you can use the gravitational pull of one planet to slingshot you to another. If everything lines up correctly, you can even visit all the outer planets in a single grand tour. 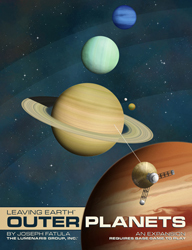 Outer Planets builds on the rules of Leaving Earth, adding several new features, including: scientists who can study samples without having to bring them home to Earth, slingshot maneuvers that are easy to use (but only available during certain years), exploration that changes the available missions on the table, aerobraking as a dangerous way to perform maneuvers with much less fuel, and several new types of probes to explore icy surfaces and dense atmospheres. Dozens of new locations to explore. New types of probes and a new rocket design. Samples to collect at each of the new moons. Missions at many levels of difficulty. New spacecraft cards and tokens. Tablets to help you plan missions (useful for the base game and the expansion). Launch window planning charts to find the perfect time to launch.